In August 2016, after many delays since it was first discussed back in 1894, the Greek parliament approved plans for the construction of the first government-funded mosque at a former military base at Votanikos, near central Athens. The mosque wouldn’t have the traditional minarets. Athens Muslim community, however, fears that once the mosque is opened, government may close all makeshift mosques. The project, which will be undertaken by a consortium of Greece’s biggest construction firms (J&P-Avax, Terna, Aktor and Intrakat) was due to start in November and is scheduled to be completed by April 2017. According to Giorgos Kalantzis, the secretary general for religious affairs: “It is estimated that the mosque in Athens will have a capacity of approximately 350 people and it will be under the supervision of the Ministry of Education and Religious Affairs. The governing committee of the mosque of Athens shall administer, manage and maintain the mosque.” The cost of this construction is forecast to be one million euro ($1.06m) and will be funded in its entirety by the Greek state. Speaking in parliament in August, Nikos Filis, the minister of education, research and religious affairs, made his intentions clear when he assured the Muslims of Athens they would have an official mosque: “The existence of makeshift mosques is a shame for the country and the Muslims who live here,” he said. Greece was ruled by Muslims from 1458 to 1821 CE. During this period, Greece like Spain, Sicily and Malta became the most prosperous, enlightened and free of religious persecution by the Church against Jews and Gypsies. However, during such a long rule, Muslim remained in minority which was due to the fact that Muslim elites did not force their religion upon the native Christians like the Christian did once they became rulers again after the decline of Muslim power in those countries. Several Greeks who converted to Islam under Ottoman rule – occupied high positions at the Royal Court. For example, Huseyin Hilmi Pasha (1855-1922), whose Greek Christian grandparents had converted to Islam, rose to become Grand Vizier (prime minister) of the Ottoman Empire. Following the so-called War of Independence (1821-1828), a great majority of Muslim population fled the country and took refuge in neighboring Turkey and Cyprus. Those who chose to stay back were, like in Spain, Sicily and Malta, either expelled from their lands, massacred or forcibly converted to Christianity. During the Ottoman rule Athens, the capital city, had 72 proper mosques open for five-times daily prayers. After 1828, they were all turned either into army barracks, or parking lots, or supermarkets. 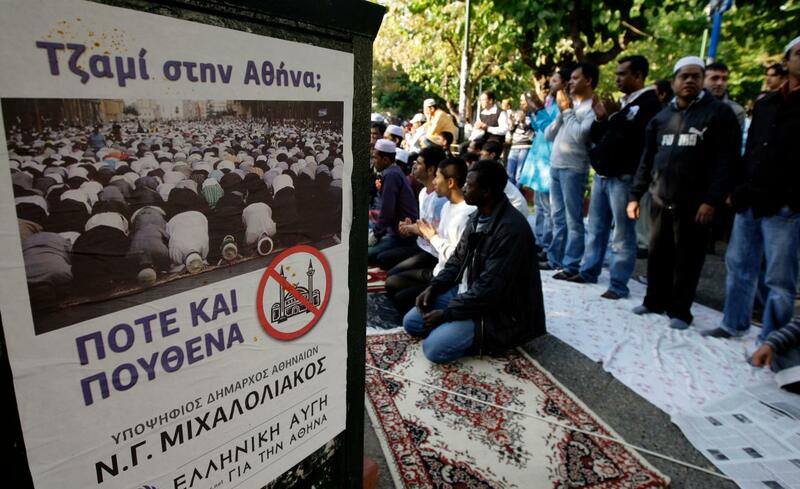 Athens is the only European capital which doesn’t has a single mosque for city’s 200,000 Muslim population. Greek Muslim community is one-million-strong. Contrary to that there are two synagogues and a Jewish Museum for city’s 2,500 Jewish population. It’s a crime in Greece to deny that Nazi killed six million Jews during WWII. Some readers may not know that the word Holocaust is of Greek origin meaning sacrifice by fire, even though no gas chamber has ever been found inside the so-called concentration camps. The Jewish historians and scholars have also failed to come up with any reasonable proof that Nazis did sacrify 6 million Jews on fire. The Ottoman rule was a FOREIGN occupying power. Inability to understand why that was hated by the local population is probably due to bias of seeing everything in terms of Islam’s superiority as a religion. Everywhere in the Balkans where the Turks ruled they were hated because they were the foreign yoke squeezing the lifeblood out of the country, taxing even the smoke!!! (a tax on he number of chimneys). “Prosperous”? That’s a laugh. Only the corrupt elite who served the Turks prospered, the same way the corrupt Western elite today serves the zionist masters. Corruption is what it brought to the Balkans whose people learned a new word: Bakshish. “Enlightened”? yeah… Turkish squatting toilettes. Turks before they converted to Islam were far less barbarians than the Christian Russian hordes and European Franks and Crusaders. Their victims, especially Muslims, were replaced by Christian barbarians in Siberia, Azerbaijan, Kazakhstan, Chechnya, Spain, and Malta, Sicily to name a few. Muslim rulers taxed (Jaziya) their non-Muslim subject far less than Muslim are required (2.5%) to pay annually. In order to test your great knowledge of Islamic history – could you enlighten the readers how many of the Christians among 525 US Congressmen and 100 Senators don’t lick Zionist AZZ every day? I will forget the political filth in Christian Europe and Russia. Also read link to Israel Shamir to find out how good Ottomans were to your Christian ancestors under their rule. My knowledge of history is not of “islamic History”– simply HISTORY, which I don’t view through the lens of one faith or another, nor do I follow the dichotomy that if the Turks were bad they were bad because they were Muslims and this must mean that I think whichever elite under Christendom was good. How many Christians in the US Congress lick zionist boots. All who hang on. Those who don’t (like Cynthia McKinney) get booted out by the boot they refuse to lick. Do they do because they are Christians? That’s a hoot. How many Muslims lick zionist boots? Look no further than the emirates and on and on. Allow me, who come from the Balkans, to know a thing or two about the legacy of the Turkish yoke better than you. Allow me, a graduate from Catholic Mission, to tell the truth about your Judeo-Christian filthy history.